With 6-1 NFL Odds, the Baltimore Ravens Could Be the Team to Beat in the AFC in 2010: With a significant upgrade at the wide receiver position, two rising stars on offense, and an always stout defense, the Baltimore Ravens feel they are poised to take the next step after a 9-7 season and a beating of New England Patriots in a first round game in 2009. The Ravens are 6-1 NFL odds favorites to win the AFC in 2010 and for good reason. Their biggest acquisition in the off-season was dynamic wide receiver Anquan Boldin from the Arizona Cardinals. Boldin brings big play ability to the Ravens’ wide receiving corps, and frees up space for veteran Derrick Mason. Boldin’s addition also raises the stock of third-year man Joe Flacco. Flacco, who did throw 21 touchdown passes in 2009, must make the next step in his career. He will also get plenty of help in halfback Ray Rice. Rice had a breakout year in 2009, combining for over 2,000 yards rushing and receiving, and will be central focus once again in 2010. 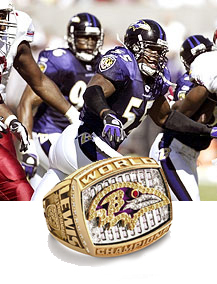 The defense, always solid, returns seven starters for the 2010 NFL schedule, including inside linebacker Ray Lewis (Mr. Raven), outside linebacker Terrell Suggs, and safeties Dawan Landry and All-Pro Ed Reed. Reed is starting the preseason on the PUP list with a hip injury, and his health is vital to the Ravens’ success since he is one of the most dangerous defensive players in the league. The Ravens also lost starting cornerback Domonique Foxworth for the season so the depth in their secondary will be tested. Can the Ravens make a run at representing the AFC in the Super Bowl odds matchup in Dallas? With Boldin, Rice, and that defense, they have a chance with much of their chances riding on the broad shoulders of their young quarterback.